So I've been really debating on posting this, mainly because of the boring pictures I've got due to me being a one man operation. There wasn't much to look at till last night and now that I can see the finish line, I think it'll turn out ok. Being only my second folder, I'm still learning quite a bit on the process so bare with me. I'll try to explain things as best as I can and hopefully my success's or failures will help someone. I first start out with lot's and lot's of sketches of different designs. The problem with folders are you have no room to work with. Completely open, the knife looks perfect and when you fold the knife in you realize that the back spine is in the way of the blade closing fully... and etc. Lot's of small detail has to go into designing a folder. I went through 5 or so designs till I found one that worked. Also pictured, is my steel that I'll be forging. 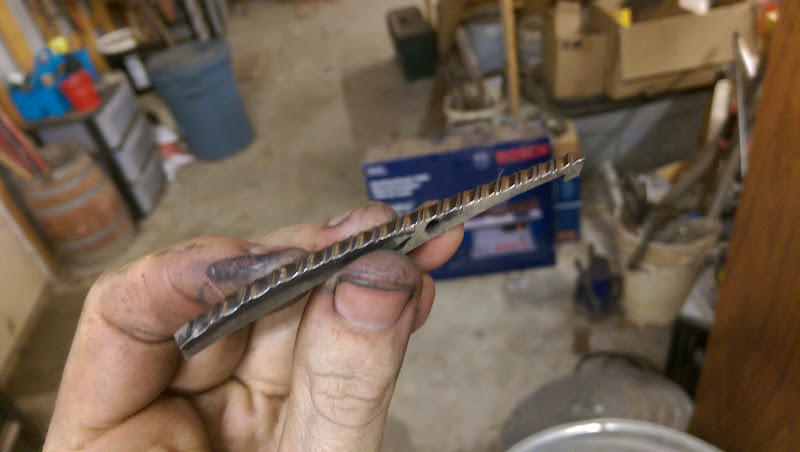 I cut it into three sections and forge welded together because I wanted a much higher layer count. Next I trace my design and cut out my liners from Titanium. This stuff sure has as unique spark and sparks HOT. 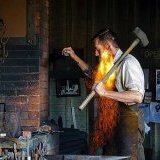 I lit my leather apron on fire with just 4 seconds of sparks hitting it. 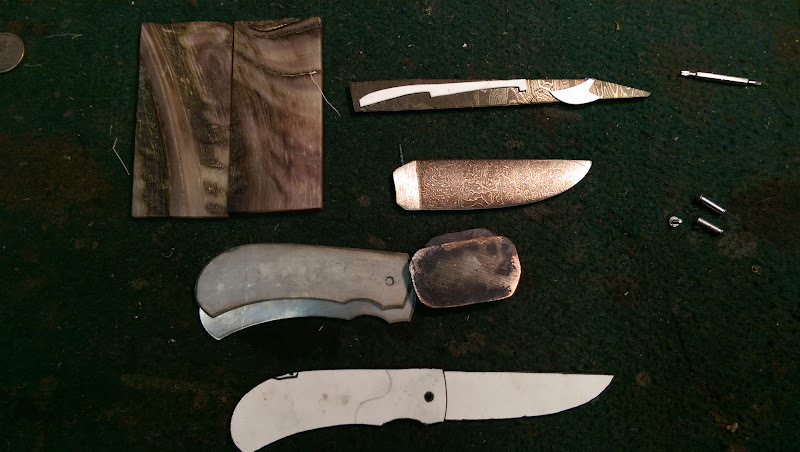 For my bolsters I'll be making some Mokume from copper and nickel. Materials wise, it's probably not best to use coins? I actually don't know the laws of that but I went ahead and did it anyways. Makes for a good story. =P Notice my clamp I made. It works quite well in keeping things together. Doesn't last long though. 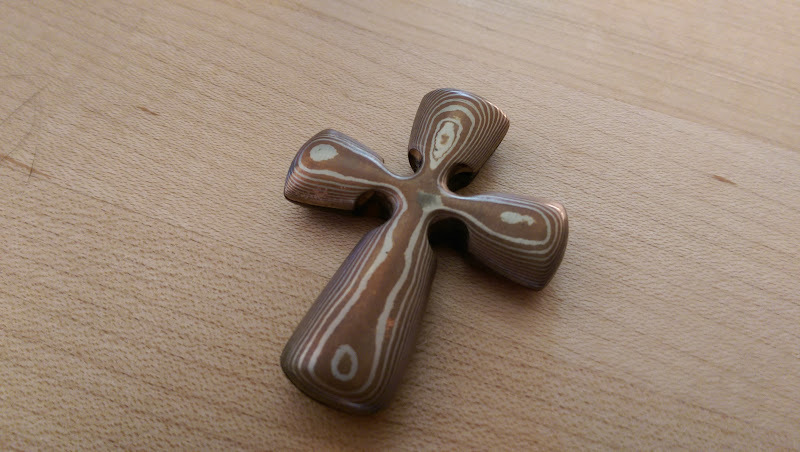 The bolsters should look like this cross I made awhile back. Here is pretty much everything all ready to go. 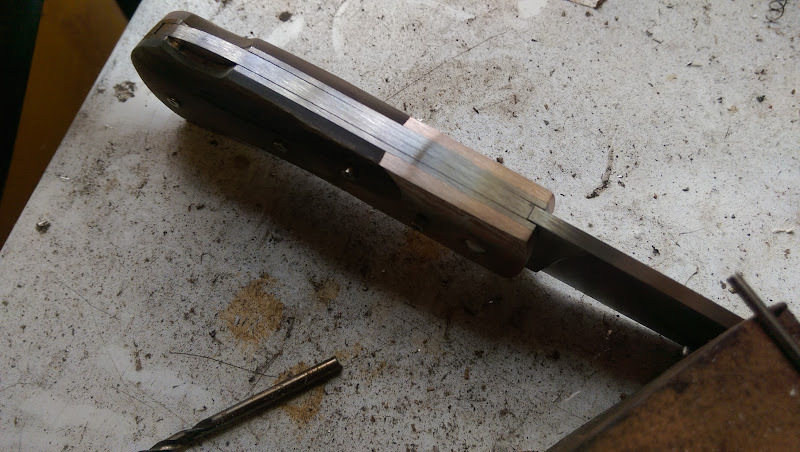 A scrap piece of PW steel is used for the spine and spring lock. 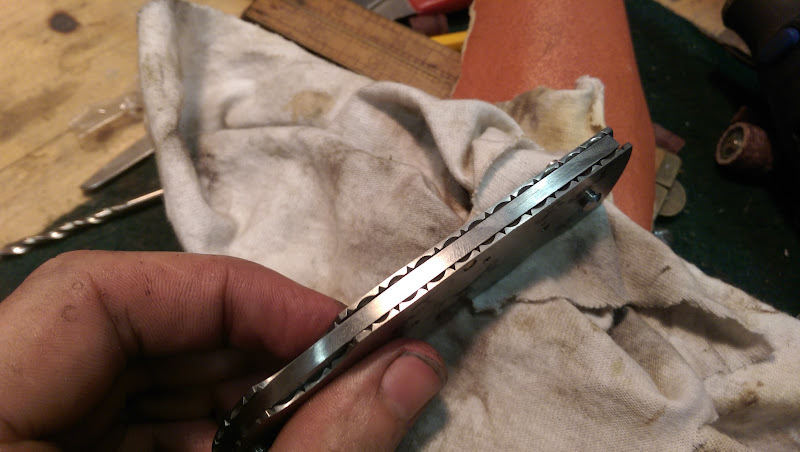 Notice the high layer count on the rough cut blade. 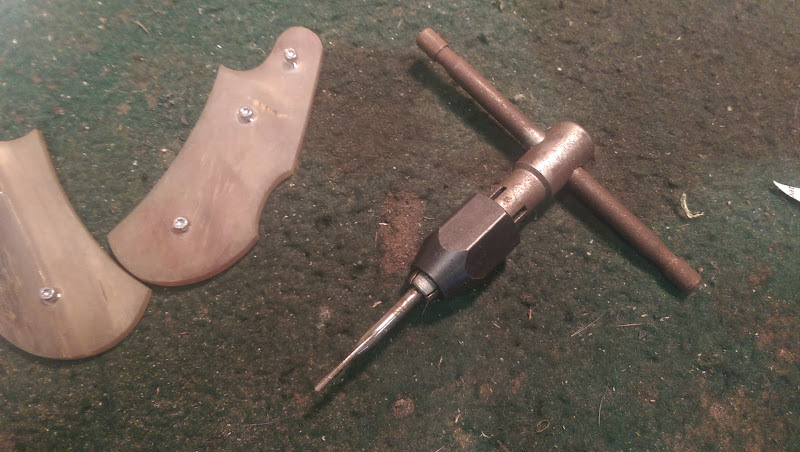 I drilled my holes, installed everything and made sure my knife functions correctly. All fine tuning can be done later. 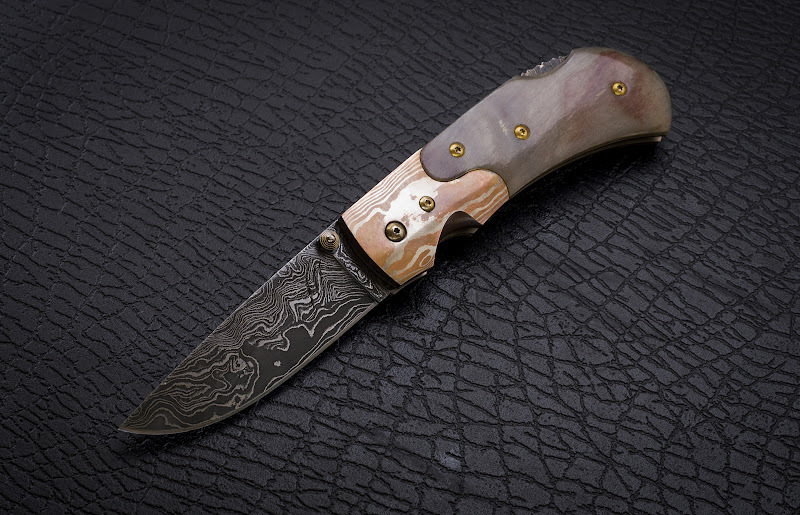 Now some very important things to know about the lock on this style of knife is that it needs to be cut at a certain angle in order to have a smooth action. Notice a 90 degree angle in the front, and it's slanted in the back. This makes it so that it won't rub and grind when releasing the lock. 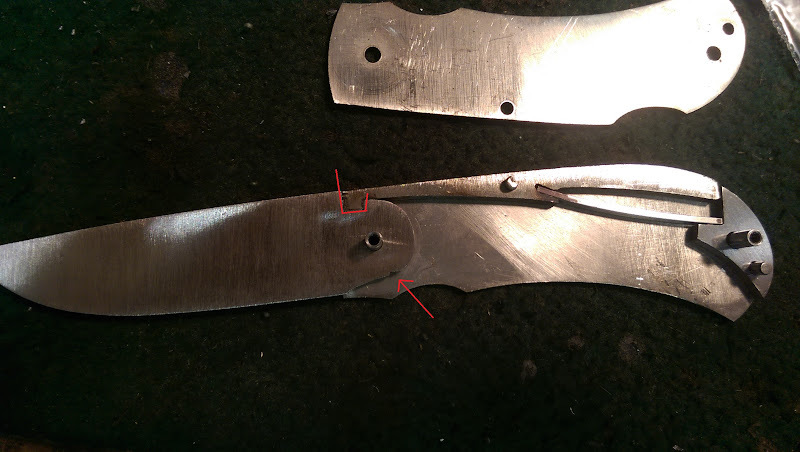 Also, the arrow points to a small notch that I made to keep the blade closed when in the closed position. The back spring provides tension pushing the lock into the notch. 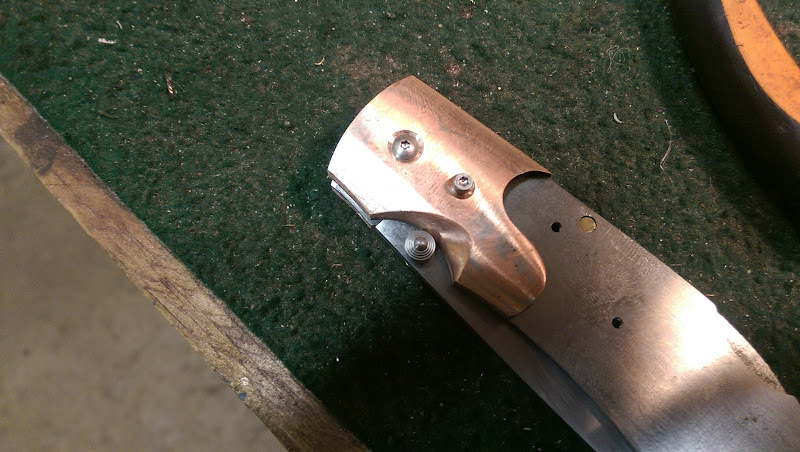 The blade is rough ground and the thumb notch cut in on the spine for releasing the lock. Now's the time to start working on my bolsters. I start drawing them out to the thickness I need and shaping them. Forging this stuff makes me nervous, as it looses heat extremely quickly and can delam like crazy when forged too cold. 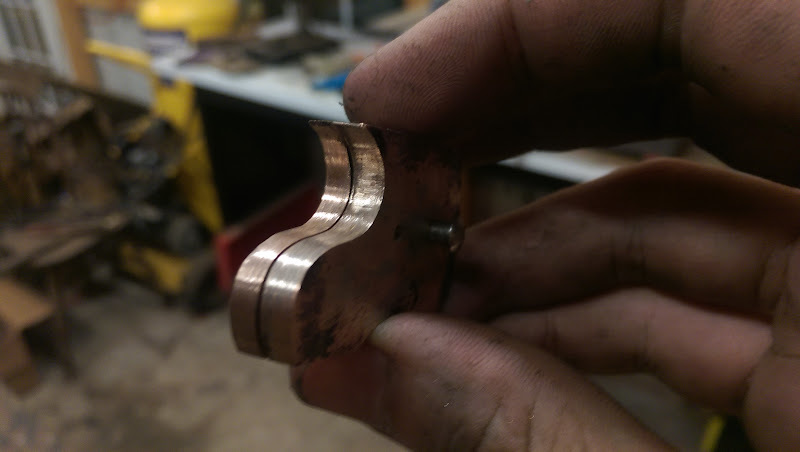 Anneal often and you should be good. So now I'll rough cut my horn and start shaping the inner radius's to my bolsters. After I get it close to the bolsters, I'll actually hot fit it on. You need to be careful about doing this. Too much heat will mess up your scales. 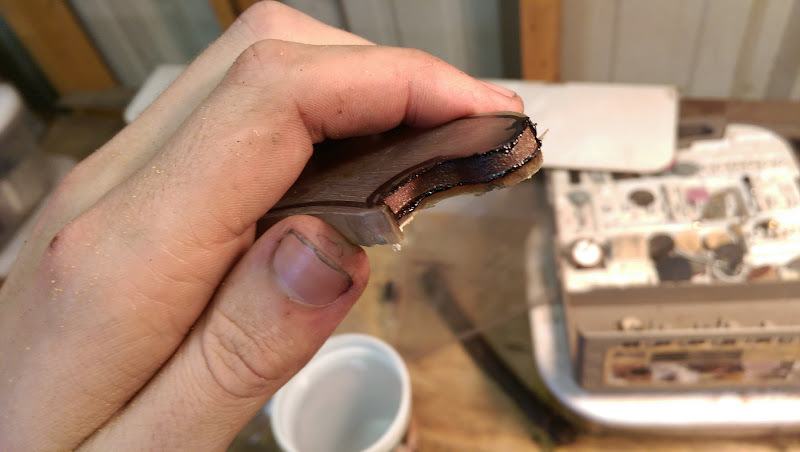 The burned part is only on the surface and you get a pretty much perfect fit when cleaned up. 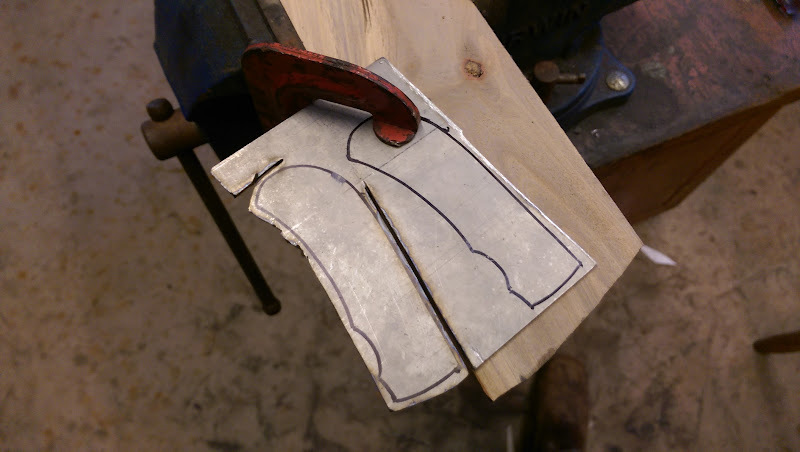 Once both my scales are hot fit to the bolster, I'll start rounding it out roughly with a file and then finish it on my belt sander. 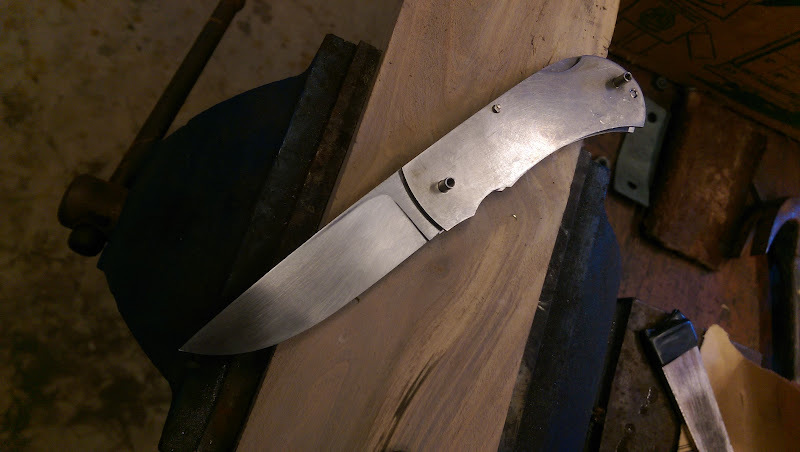 I got a little caught up with fitting the scales and forgot to get some photos, but here's one side of the folder pretty much done. I basically had to individually drill each hole with 3 different drill bits, tap the liners, and the screw in, and repeat. Extremely tedious. And tapping titanium is NOT FUN. I've broken way to many taps and you can't get the broken tip out of the hole. I went slow and everything turned out perfect. I also chemical blued the mokume and kinda like how it looks. We'll see on the final product. 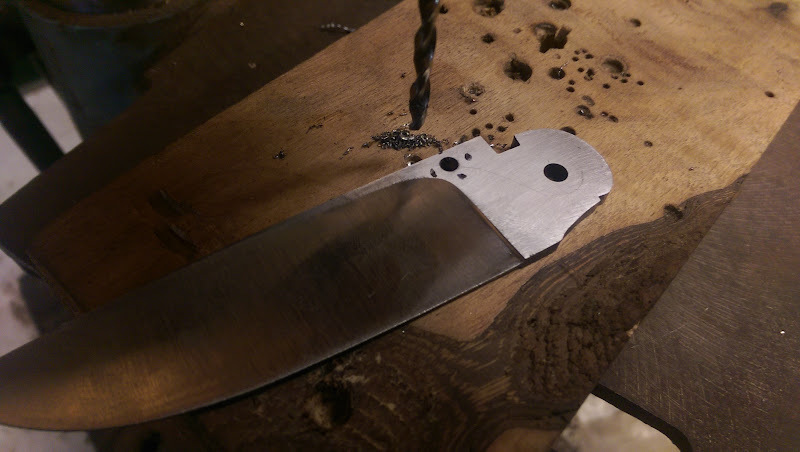 Here's a better picture to visualize what the knife is starting to look like. Anyways, hopefully yall don't mind a halfway through WIP. Filework and heat treatment will be in the next few days so stay tuned. That is looking great! I'm really liking the look of the handle too, the kind of yin and yang cutout is very attractive. My only problem with the half done WIP is that we have to wait to see more! I really admire your use of materials and aesthetic, that horn is gonna look great when polished up! Looking great, I look forward to seeing the rest of the wip. Don't quote me on this, but I think you can get the broken tap out of titanium by dissolving it with acid. I haven't tried it, but my understanding is that titanium isn't reactive so should remain intact while the steel dissolves, I would think ferric would be appropriate. Also if your having that much trouble with breaking the taps you may want to try stepping up a drill size. I've tried makin a lockback one time and didn't even get close to where you're at before I got frustrated to the point I quit. You look like you've got it pretty well figure out and it's lokin like a nice little knife. 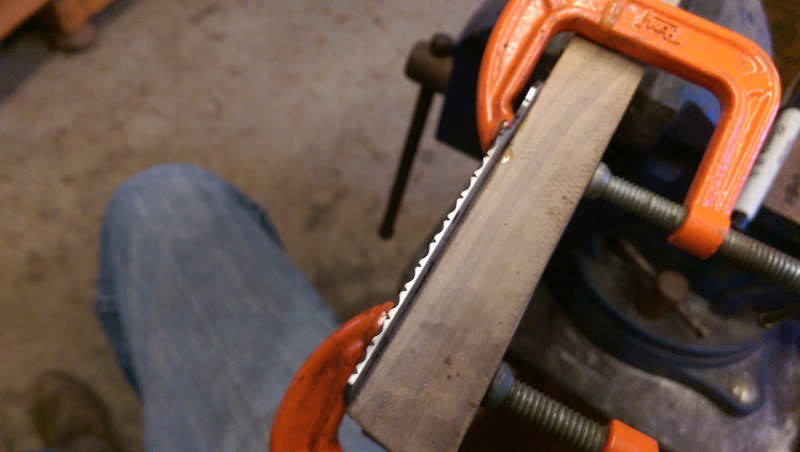 Well I say little but it looks like it's about a three inch blade. I'm lookin forward to seein more. This is great stuff Austin! Please keep it coming. Good gravy, I'm glad you decided to post this. That is the best tutorial on a lock back I have read so far. One of these is in my future, so I will mark this thread for reference! Oh my, I feel like I left out a few pictures and parts for this to be pinned. I'll probably add a few more here and there to fill in some spots. Thanks for the great ideas about getting those tap tips out! After learning my lesson (a few too many times) I bought some high speed taps which seem much better quality. 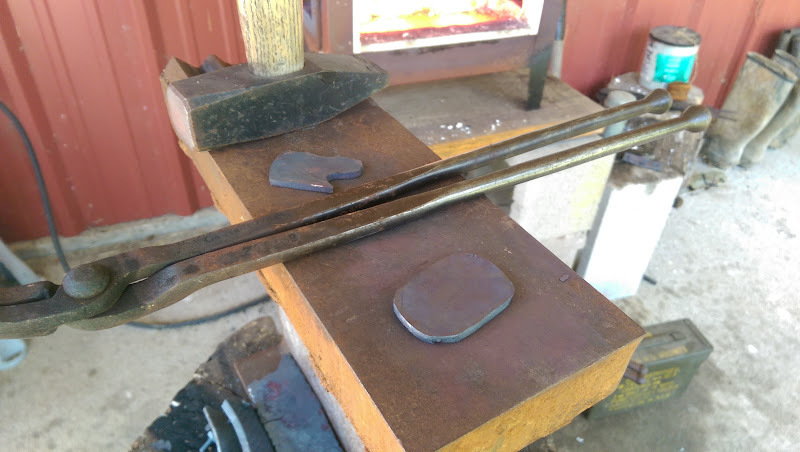 Hopefully it won't be too hot today to get a little filework and heat treat done. See y'all soon. I'll probably add a few more here and there to fill in some spots. While you're at it feel free to add the boring pictures you mentioned too, since there clearly aren't any in what you have posted so far. Anyways yall, I got the liners all fileworked today and hopefully will get the rope pattern done on the spine tonight (as well as heat treating the blade). First off, I need to make room for my washers. Notice the gap between the liners and the lock/spine. 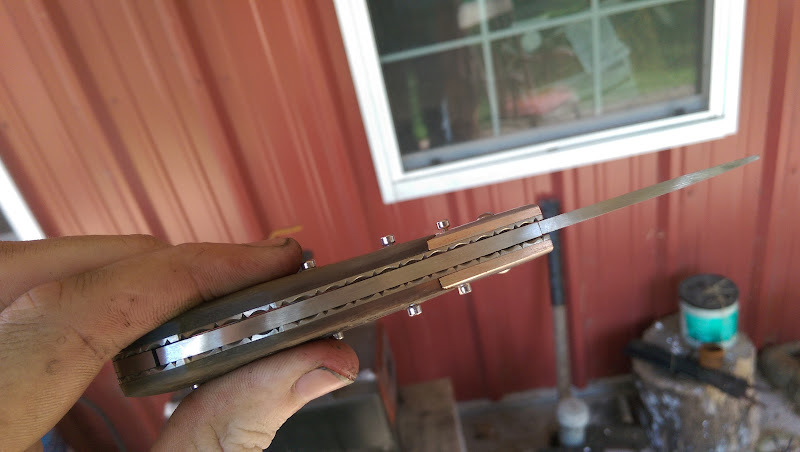 Since the spine is a tad over an 1/8th of an inch, the flats of the blade need to be flat ground just enough so the washers can fit in with no gaps between the liners and lock. After that's done, there is basically no gaps and the liners are flush. I don't have all the screws torqued up so there is a small gap. So now I'm ready to start the magic. 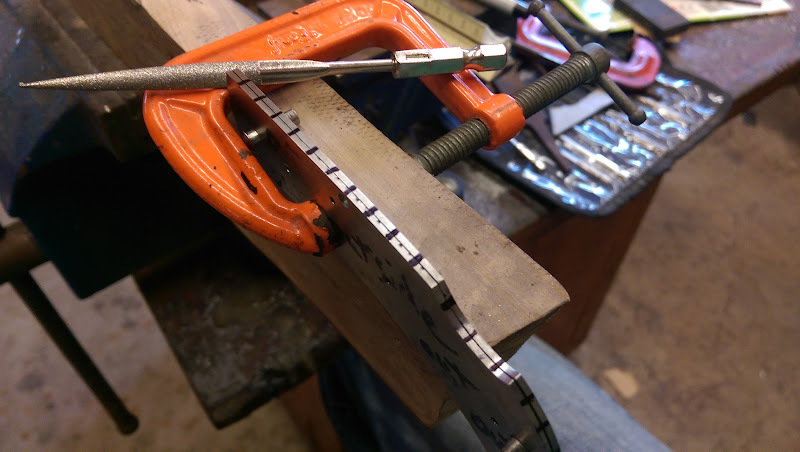 Both liners were clamped together and marked evenly so that they SHOULD match when I'm done... Of course that didn't happen later. Toss on some relaxing music (filework makes nervous....) and get to work. 30 mins later I have one side roughly done and off to the other side. Both sides are done and look pretty good. I really got out of line near the thumb release. 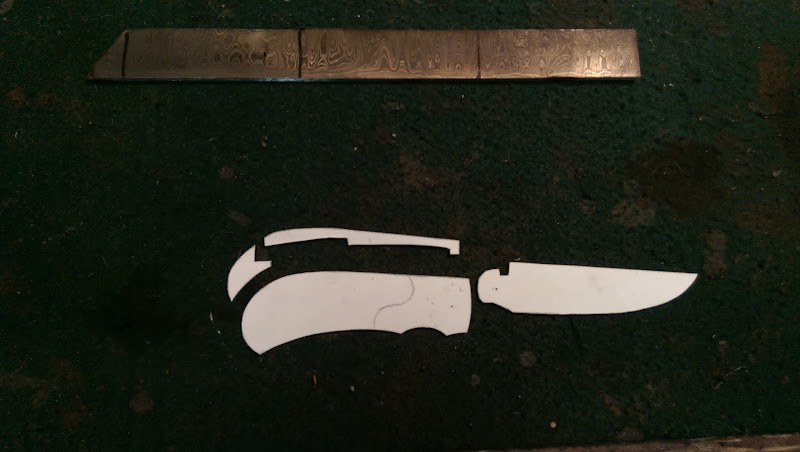 And here's the knife put together awaiting the lock/spine filework as well. Haven't decided on what pattern to put on it. Of course all the steel screws sticking out will be replaced with some gold plated ones that are counter sunk into the handle. thanks for this. I really enjoyed it, and learned a lot! some day I will make one of these. Thanks everyone for the great comments. I'm glad yall are finding this interesting. 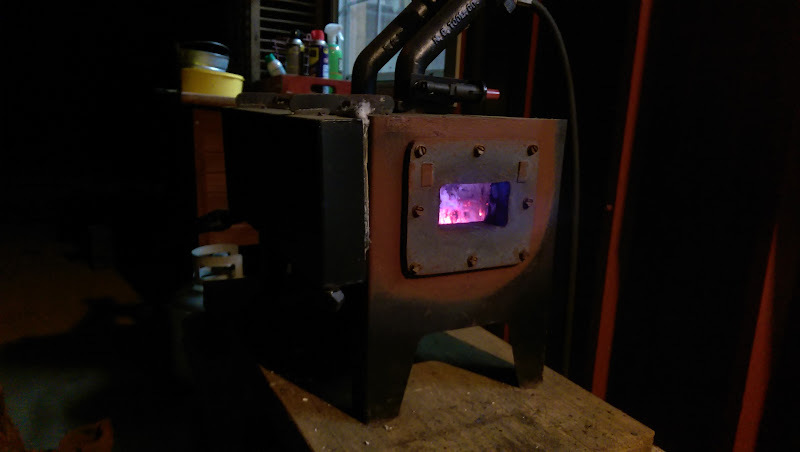 Just the usual heat treat and such tonight. Normalized twice and quenched the Damascus in peanut oil. The blade looks good and absolutely no warping. This is a picture of my hand tap I use. Nothing fancy! Just have to go slow. 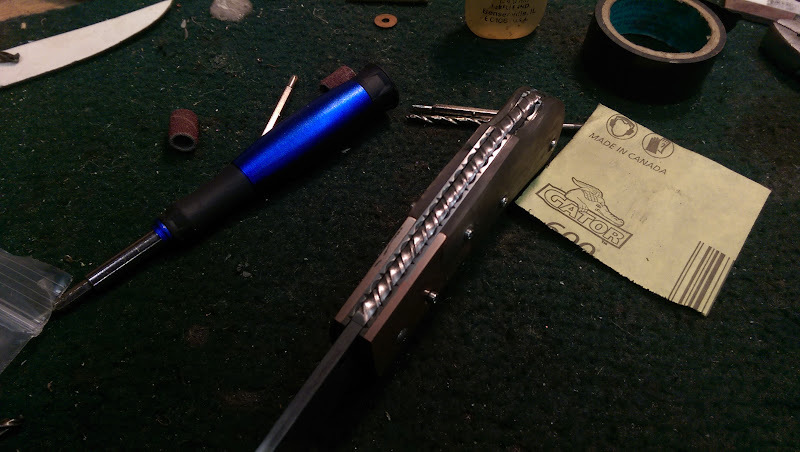 I'll update the first post with a parts list and other details in the next few days for those wondering exactly what size screws, taps, bits, liner thickness to use. I know when I first wanted to do this it was overwhelming the amount of parts that had to fit with one another. Here I drilled a 1/8th hole for my thumb studs. I bought an ambidextrous stud. as well as a black opal mounted stud and I can't decide which I'm going to use. The jewel almost looks too fancy so I'll probably just use the latter. Forge is warming up. 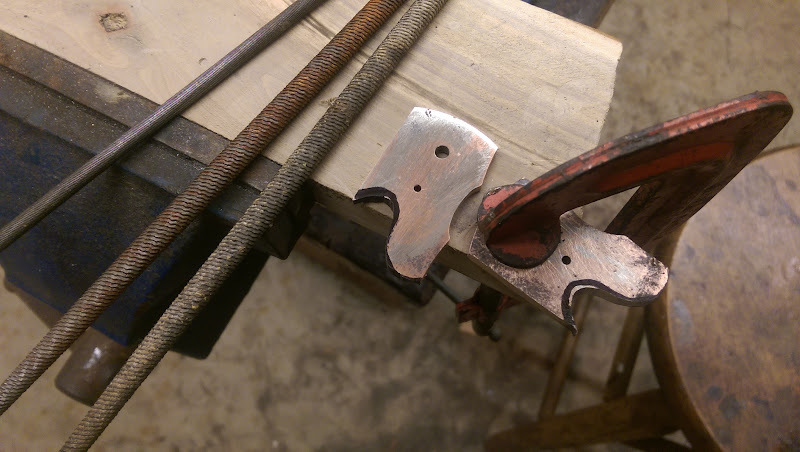 I also threw in two farriers rasps to heat my oil up with before the quench. After normalizing twice I go back in and watch for the shadows and quench once the blade is uniformly heated up. The knife goes into the oven at 350°f for three, 2 hour cycles. 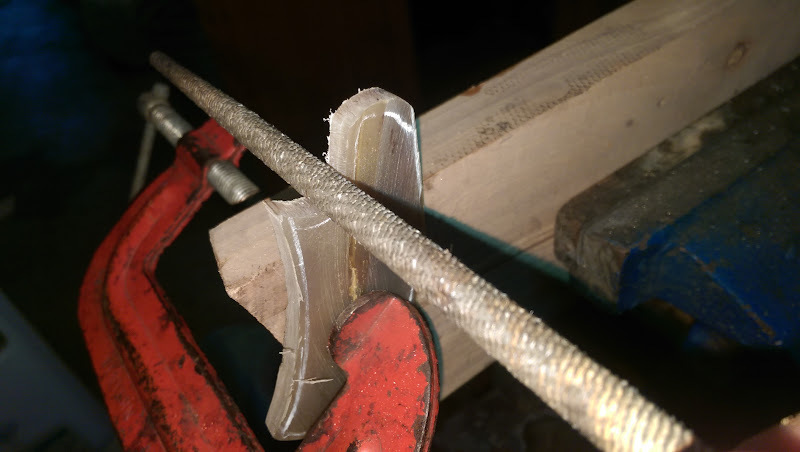 Should come out to be a decent hardness, however I can never get this particular damascus (5160, 203e, 52100, 15n20, nickel) to harden up as well as my 1084 or W2. Still holds quite the edge though. Sorry I've been a bit behind on posting. Working in 100 plus heat with a portable a/c unit is miserable. Yesterday I worked till 2 in the morning doing filework and working with the bolsters to allow room for my thumb studs. Not the best picture, but you can see the rope pattern. 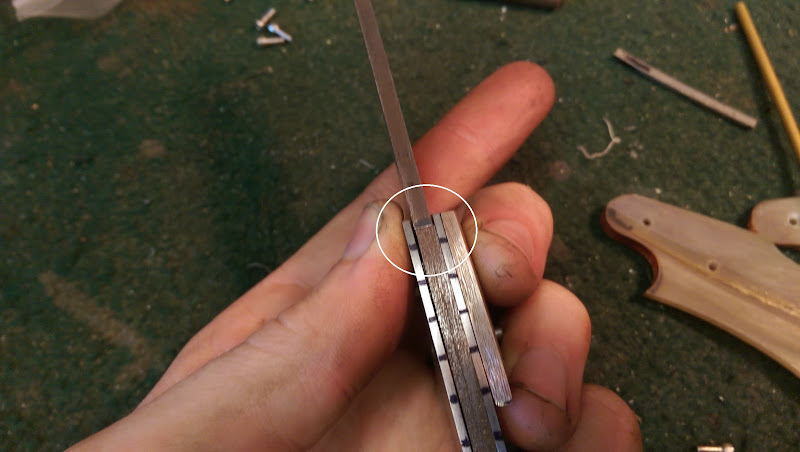 I had to go pretty shallow on the filework because I don't want my lock to be too thin and possible bend. So I soon realized I wouldn't have enough room for my thumb studs when the knife is fully closed as well as I couldn't reach them with my thumb. 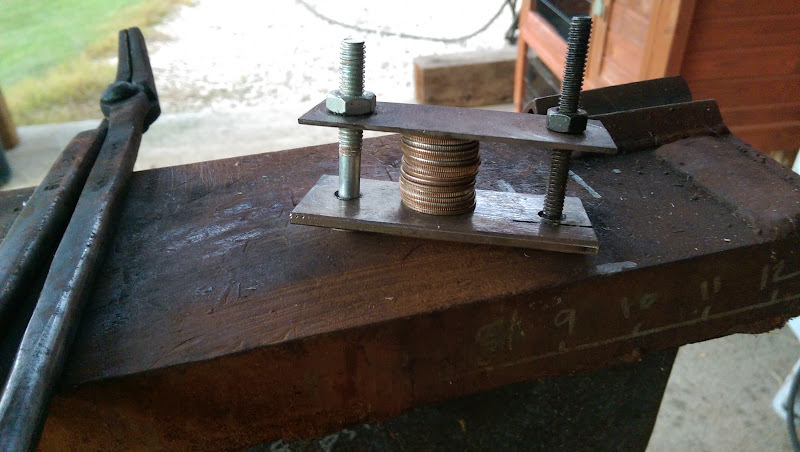 So I go a drum sander attachment for my drill press and worked in the finger notch till the thumb studs fit. 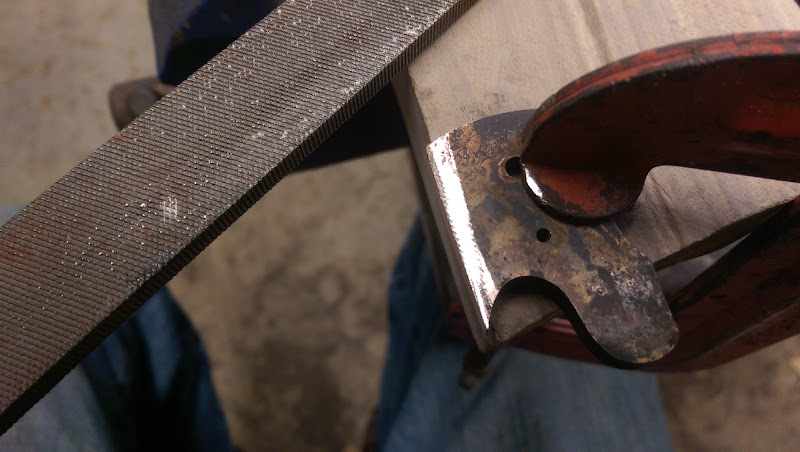 I also cut a notch on both bolsters to allow your thumb to push the blade out easier. Today I took the bolsters to a 600 grit finish ( I may change it later as it's too shiny) on my belt sander and then heat colored. The patina won't be that colorful soon. It should dull down to a nice brown color. The clip holes were also drilled and tapped into the liner. 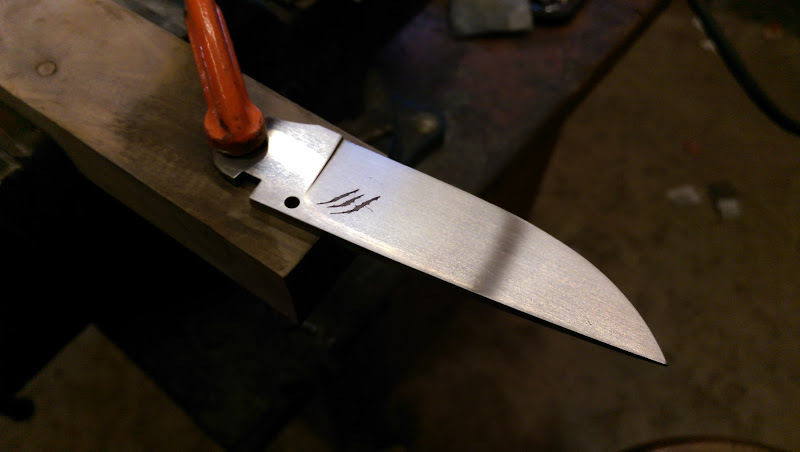 I etched my logo and cleaned the blade up to a 600g finish. It's all ready to go for the etch. The pattern came out pretty wild, and the other side has extremely fine layers. Kinda funky and I like it. All the other parts were etched and ready to go. 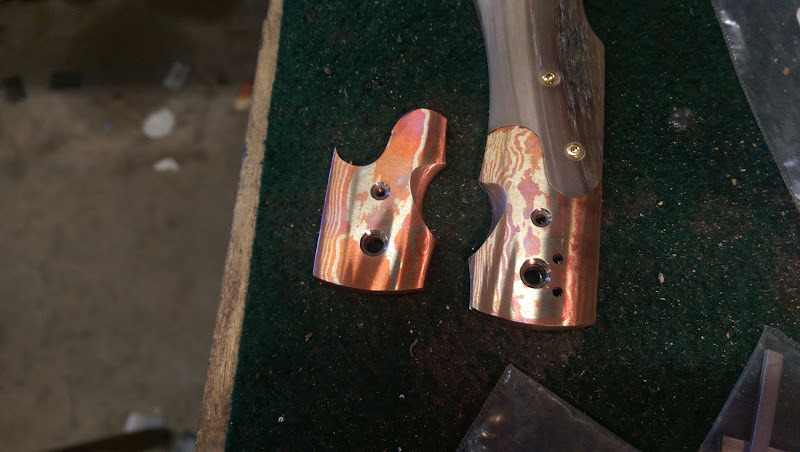 The pivot and thumb studs were heat colored to gold. 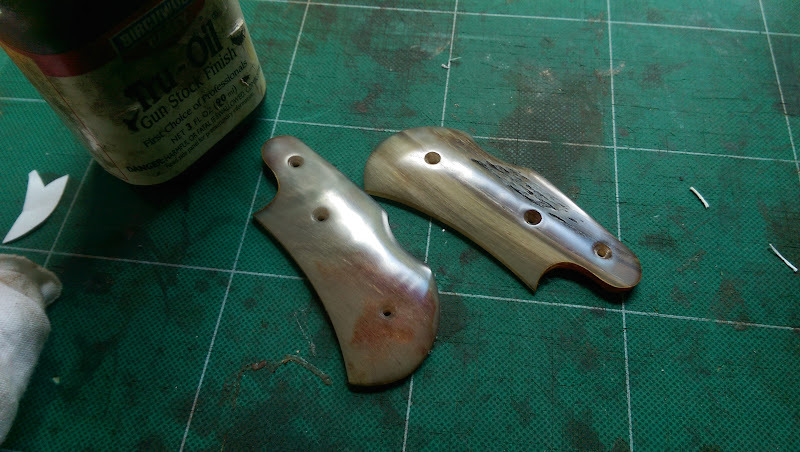 The handles are getting their coats of tru-oil. I'll polish with a soft 3m Trizact pad afterword. It's all coming together and hopefully may be done in the next day or so. Alrighty yall. 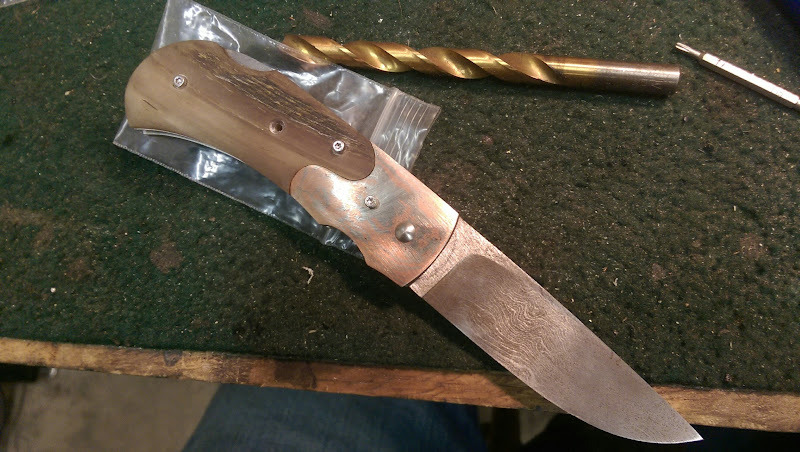 The knife is all finished. Pretty happy with it overall but there were some parts of it I would definitely do differently. 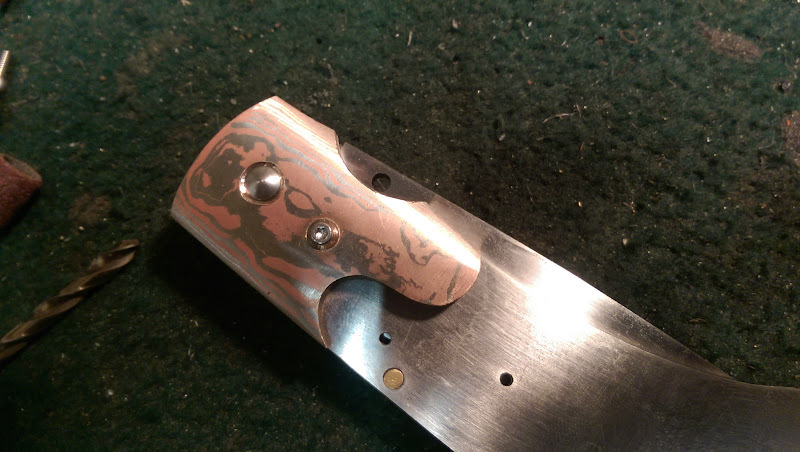 I had so much trouble getting the finish I wanted on the mokume and it just doesn't work for me. 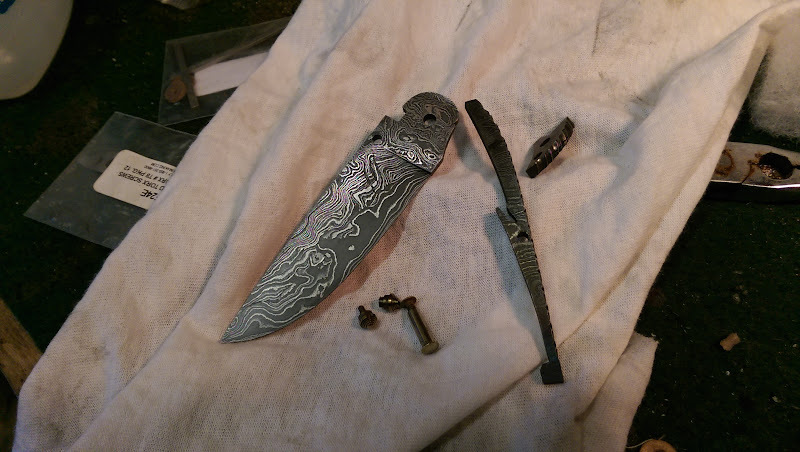 I'll probably just make some normal damascus for the bolsters next time. My fit and finish between the scales and bolsters is less then stellar as well ( tiny gap). Next time I'll just go for a more basic design for where my skill level is at. Here's my pretty fancy lightbox setup . Wish I had more backgrounds but the guitar case works good. Here's the final product. I'll post the rest of the pictures in Show and Tell. Hope you guys enjoyed this, and when I get the time, I'll try and update some of my posts with pictures and etc in a few days. 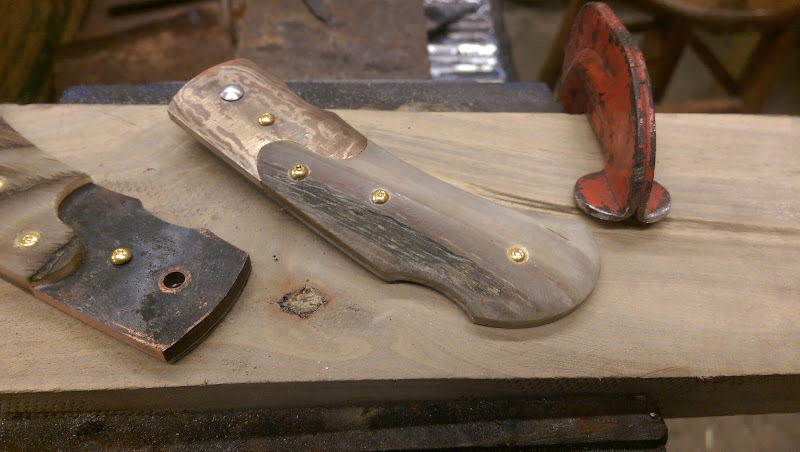 This knife took quite a bit of work and I'm tired! It turned out wonderfully as far as I can tell. 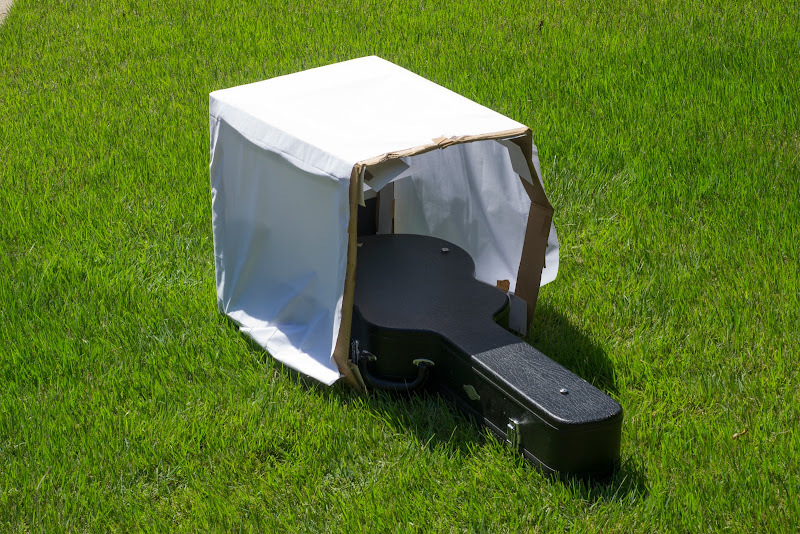 I really like your light box too btw and I think the texture of the guitar case works well with the PW steel. Thanks for posting this Austin an excellent wip! Anyway, I really enjoyed watching the progress on this one! Thanks guys! Haha the lightbox needs a little reinforcing but other then that, it gets the job done. John, I'm glad you found it helpful! It's probably not the safest way to do it, but it's effective. So what kind of "AX" do you carry in that case? Apologies but I don't know what you mean Dustin. I havnt had my coffee yet today so I may be missing something. Still not sure how ax means guitar. Sorry guys! But I play a Taylor 414ce and a collings sj series. Beautiful sounding guitars. Metal guitarists refer to their guitars as Axes, Taylors are beautiful guitars. I have a 1973 alvarez dove and a 1972 american made tele that was my grandfathers that he sold to a guy which in turn found me years later and gave it to me because he knew I wanted it.